On Friday Toshiba revealed its restructuring plans aimed at returning the company to profitability and growth through management accountability. Of special interest to The SSD Guy was the fact that the company will refocus its semiconductor and HDD businesses, currently called the “Semiconductor & Storage Products Company” partly by giving it a new name: “Storage & Electron Devices Company”. This division will focus on the semiconductor group’s good prospects and profitability while maintaining a focus on the fact that SSDs and HDDs share a business. In the not-too-distant past Toshiba has run these two businesses separately. 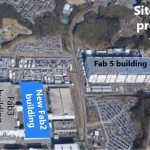 The graphic for this post shows the company’s Yokkaichi chip-making complex, with an additional blue box to illustrate where a proposed new production facility is to be constructed during the company’s 2017 fiscal year (April 2017 – March 2018). Click on the picture to see the whole site layout. Total capital spending for fiscal 2016-`18 for this facility and for additional 3D NAND tooling at existing facilities is budgeted to be ¥860 billion (roughly $8 billion US). Apart from 3D NAND, Toshiba has committed to open an SSD design center in North America and to expand its line-up of enterprise and near-line HDDs. It also plans to continue in its development of storage class memories (ReRAM & MRAM) “for high speed SSD”. These two technologies were initially intended to replace NAND flash once 3D had reached its stacking limit. That concern appears to have been addressed through a new stacking technique, leaving ReRAM and MRAM with less interesting market prospects. The SSD Guy believes that they are now being funded in response to Intel’s and Micron’s 3D XPoint Memory, against which these technologies will compete, although any of these technologies are more likely to ship as a DIMM than in an SSD form factor. To finance this turnaround the company is on an aggressive fundraising campaign, working to raise one trillion yen, ¥666 billion of which has already been realized through the sale of Toshiba’s Medical Systems business, and another ¥200 billion from sales of the company’s stock holdings. Further funds are to be raised through the divestiture of Toshiba’s Home Appliance business and additional sales of the company’s stock holdings. This presentation should finally stop all the rumors about which of Toshiba’s businesses are to be sold off and which will remain. There is little surprise that the memory chip business will remain with the company. The SSD Guy wishes Toshiba good luck in achieving its goals.